...more days to our first challenge! Today my celebration giveaway is PL cards!! 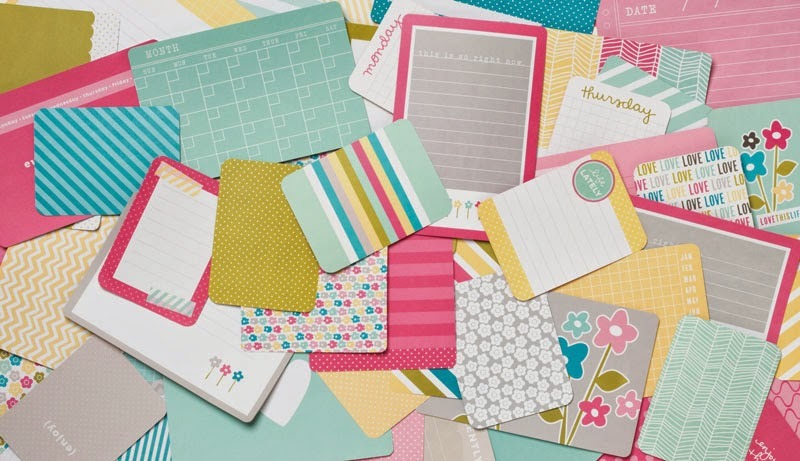 These cards work great for traditional layouts and pocket style scrapbooking. I have many cards that I would love to share with you!! Simply leave a comment on this post telling me your favorite type of scrapbooking is by the end of the day on April 30th and I will chose a random winner from all who comment!! I'm a traditional scrapper! I LOVE all of the Project Life goodies but just don't see myself making the switch. I get inspired by all kinds, but in creating my own, my favorites are a traditional page that showcases a lot of personality. I'm a traditional scrapper but I have used PL supplies when making cards and layouts. I'm traditional all the way, sticking with 12x12 albums. Love to journal a lot and layer with many different pp's. I'[m traditional and can always find a place for something different. It's scrapping, after all, lol! My favorite pages are multi-photo with journaling. Very tradition, but I'm all about the photos and the story. I just started the PL style this year and I really like it, but my favorite will always be traditional scrapbooking. I love that the PL style cards can be so easily used on traditional layouts and cards, too. I'm a traditional 12x12 gal, but I use just about anything and everything on my pages, PL cards included! I am both...a traditional scrapbooker as well as a Project Life scrapbooker. Both are great ways to preserve our memories. I do both traditional 12x12 scrapping and pocket page scrapping and I love them both equally. I mostly scrap 12x12 traditional but have done a few pocket pages. I am more of a collector of pocket stuff...LOL!! I do both! I'm starting to embrace PL as of late. But I love traditional pages as well! I do both but usually keep my PL very simple. 12x12 with lots of layering and embellishment is my fun and creative place and for that reason my favorite. I do use the cute cards on all kinds of projects though! My favourite pages are traditional 12x12s but I also divided pages when I have a lot of photos and mix the two together. 12x12. I have done some other sizes in the past but haven't left my comfort zone for pl. Oh girl you know I love me some Project Life cards! lol! Thanks for the chance to win. That bowl looks so yummy! I am a traditional scrapper but us those cards on layouts and making cards. I create traditional layouts 12x12 and A4, and weekly Project Life spreads. I love doing both but layouts will always be my first priority. I think I prefer 12x12 traditional scrapbooking but with the number of grands going up I find the pocket pages allow me to use more pictures!! I'm mostly a traditional scrapbooker and just getting into PL this year. I really like using the PL cards on my regular pages too. I am a traditional 12x12 scrapper. Love using PL cards on my layouts! My favorite is 12x12, but I do mix it up! I love 12x12 one page one photo layouts! I love to do PL. I still do traditional 12x12 but primarily do PL right now.